Everyone I know is busy cleaning their house and shopping for new artifacts. Wondering how you are going to celebrate this Diwali.......here are some simple suggestions without being heavy on your pockets. I like the simplest things of using just clay or ceramic diyas; they light up the house beautifully and dramatically or welcome your guests with simple rangoli and a diya at the entrance. I also used some lights (mirchi lights) from the previous Diwali and managed to create a romantic atmosphere in my living room (I made used of the throw-away wine bottle). These lights are commonly seen in Mumbai for decorating balconies. One more item commonly seen are the colourful lanterns used outside everybody's balconies. 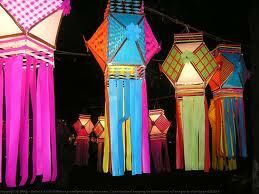 There are all kinds of Indian and Chinese lanterns widely available during this season. It is also the time when you gift your special ones. 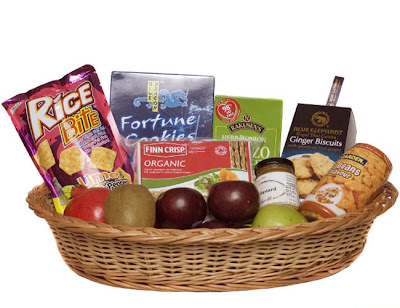 One best thing would be to gift some really good gift hampers - an assortment of various products. Nature's Basket has some really cool gift hampers this Diwali. You might want to check them out and get some ideas. You can also go to Crawford Market and buy your own assorted products and create you own basket. That sounds like really good fun and it's a personalised way of gifting. And of course a time to eat and share some good food. Every festival is celebrated with sweets and what a better way to start Diwali with Kheer.Kheer is everybody's favourite and easy to make. It is a rice pudding which requires the right consistency. Kheer is not complete without cardamom and Kesar again is optional. 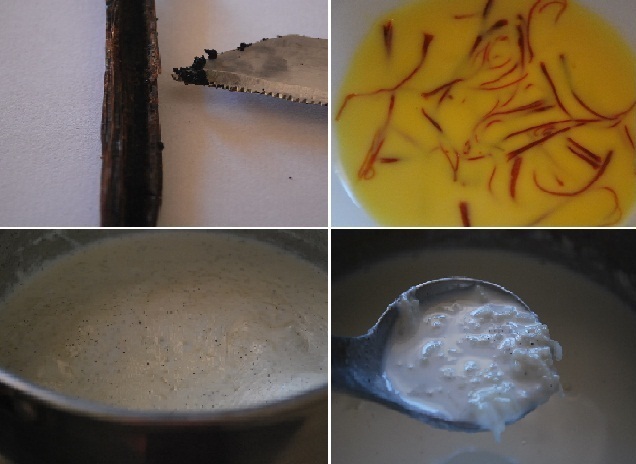 Tri-flavoured kheer has a vanilla twist to it. Thats right..a vanilla, cardamom and kesar flavoured kheer. A beautiful blend of these flavours keeps you guessing on every bite, whether it's vanilla or kesar or cardamon.....Enjoy the fun- filled flavours and Happy Diwali!!! Wash and soak the rice for about an hour. Heat milk in a pot. Add vanilla extract before the milk comes to a boil and enjoy the vanilla fragrance taking over your kitchen. Add soaked rice (without any water) to the boiling milk. Let the milk and the rice cook on medium flame for about 20minutes. Add sugar and let it cook for 15minutes.You will see that the whole grain rice would have become half it's size. It kheer is almost done and you will also notice the thick consistency. Add cardamon and turn off the gas. Let it cool. Serve cold or at room temperature, garnished with kesar and chopped almonds. This is my submission to this month's event Celebrate Sweets - Kheer, hosted by Taste of Pearl City and Nivedita's Kitchen, to Virtual Party Snacks hosted by Ruchika Cooks and From My Home Kitchen and to this week's Blogadda Diwali Moments. Wishing u & ur family a safe and happy diwali..Beautiful kheer,looks fabulous..
That looks very delicious. Thank you for sending it to the event. Have a nice day..